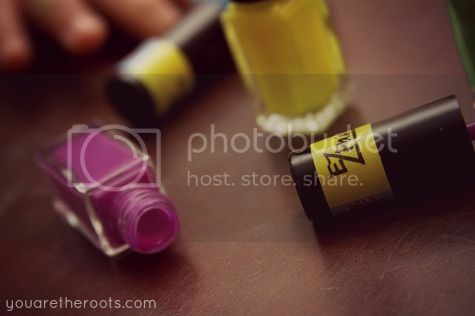 I first heard of EZpaint on a Facebook forum for local moms because EZpaint creator (and genius!) Beth is a mom of three who lives the next city over from me. It instantly caught my eye as the mom to a toddler boy who loves making art, but mostly because who doesn't love supporting other moms? I was really excited when Beth offered Ethan the opportunity to give EZpaints a go! My little artist won't turn down any art supply he's offered, but his favorite is paint. Essentially everything we owned is covered in bright, friendly shades of fingerpaint or you're likely to uncover dried, crusty paintbrushes hiding somewhere in our house. It happens. Needless to say, every last thing about EZpaint appealed to me. I mean, I'm not one to scoff at a little mess (I mean, have you seen my house? It's the definition of chaos on a good day!) but if I can avoid the spilled water, dried paint brushes and little primary color fingerprints up and down our table and walls, I surely wouldn't mind. Enter EZpaint. From a developmental standpoint, there is so much good in EZpaint, too. 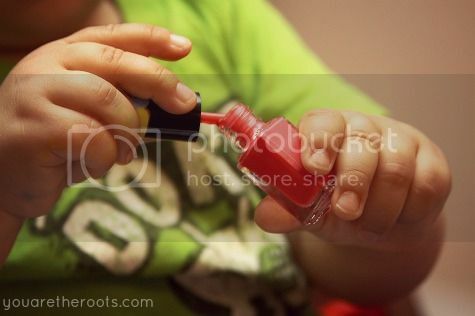 Using the brushes attached to the lid help with their little pincer grasps and it's been great for Ethan to learn to put the brushes in and take them out of the bottles, which he struggled with at first but has now proudly mastered! 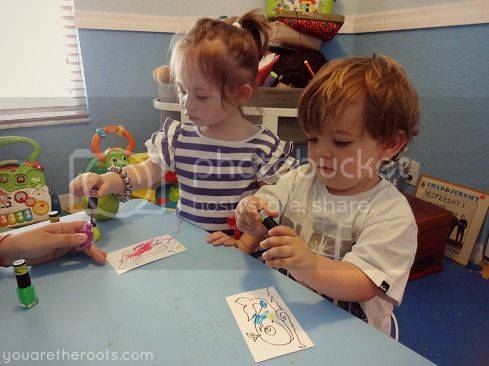 Doing so is basically like a tot school activity in itself when it comes to fine motor skill development! 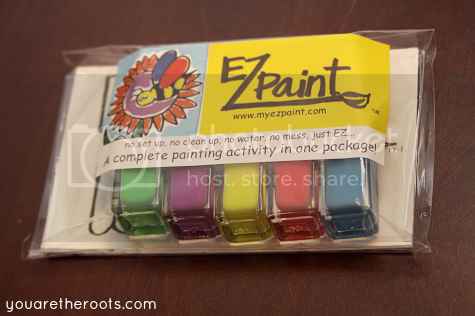 I should also point out that a five piece set of EZpaints -- which includes six EZcards as well -- is only $9.95. A quick Google search will prove you what our art supply bills already have: that other brand children's paints are already nearly double that, and that's not including the brushes (another five bucks!) or the coloring books and paper. 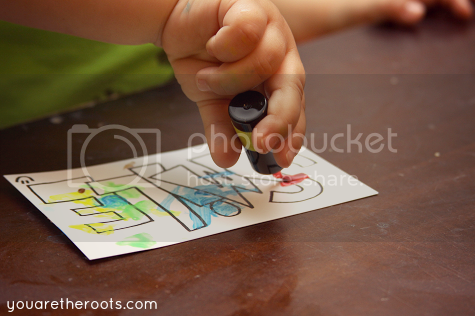 Since EZpaint has been a part of our lives, Ethan hasn't once asked for his other fingerpaints and brushes. 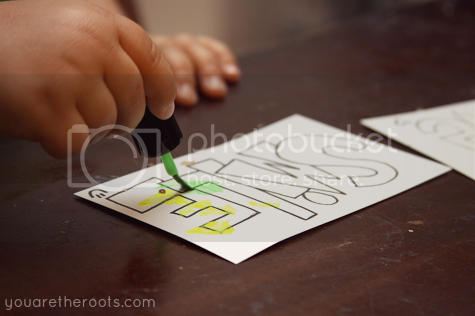 When he walks into his playroom and asks to make art, he lets it be known he means EZpaint. It's been an entirely new painting experience for both of us: no lost brushes, no mess, no clean-up, no fuss -- just beautifully done, inspirational little paintings that Ethan cannot wait to hang up on the wall. 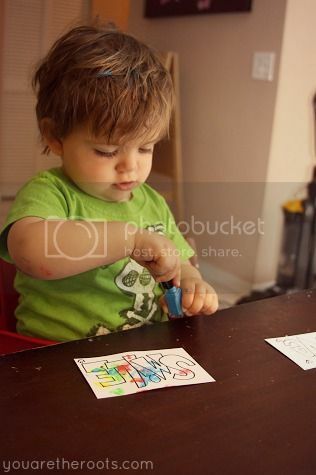 Mess-conscious moms, want to know another awesome feature of EZpaint? ...The bottles are no-spill. Yes, it's true, when clumsy little hands knock them over, you're not left with a terrible mess. It's almost virtually impossible to make a mess using EZpaint. Of course, never one to run from a challenge, Ethan tested my theory and proved that, yes, with the help of the brush, he is able to paint his hair blue. I'm proud to announce that with a little water on a paper towel, the paint came right out. No big deal. TO BUY EZPAINT: To start your shopping for EZpaint and accessories (and learn more about EZpaint), visit myezpaint.com. You can also drop by the Facebook page for EZpaint for other great updates and to stay connected! TO WIN: Beth generously is giving two of my readers the chance to win their own sets of EZpaint! These look perfect for Tristan! What a great giveaway. My little artists would love these! These are so cool! I would love to have them around for when Owen gets a little older. Brilliant!!! I could see all of my kids loving these but I'd really love for Micaiah (our 16 month old) to have a set! We have yet to do even one art project because of the mess. These would be for my son. Thanks! Awesome!!! Tripp would love these... I'm sure he'll be getting some one way or the other, soon! I;d love to win for my son! I'd like to win a set for my daughter Jade. I would like to win them for my son. i would win them for my son, he owuld love this! 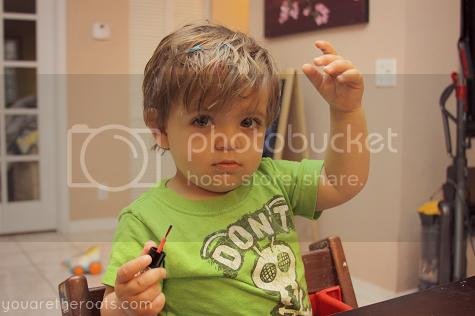 My 3yr old nephew Julian who loves to come over and wreak havoc. I would love these for my nephew. I would love these for my 2 1/2 year old daughter. She LOVES to paint!!!! !